Need a recipe for a delicious brownies? 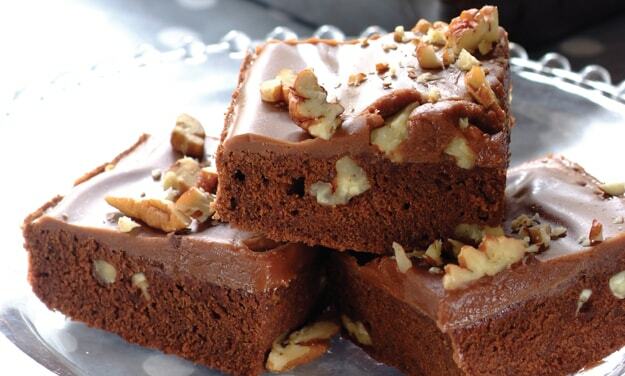 Try this quick chocolate pecan nut brownies recipe for a delicious baked treat today. Stork – love to bake. Mix the cocoa, milk, Stork Bake, castor sugar and vanilla essence. Add the flour, nuts, beaten egg yolks and salt. Fold in the egg whites so that the mixture is thick but pourable. Pour into an 18 x 18 cm baking tin brushed with Stork Bake and dusted with flour. Bake at 170°C until they rise and set (about 15 - 20 minutes). Remove from the oven and allow to cool before cutting into squares.